Essential eye care can be quite expensive, and more so when you are desperate to get your hands on the latest must-have designer frames. It can be quite a shock when you are presented with a large bill and we understand that not everybody has the funds readily available to them. 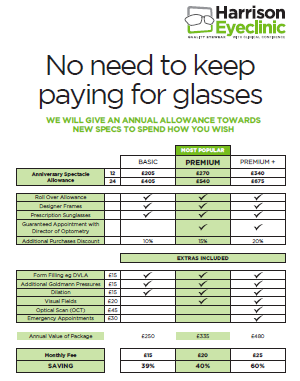 At Harrison EyeClinic, we want to take the stress of a large bill away, so that you can enjoy the finest clinical care and high quality eyewear that March and Fenlands has to offer. By joining our unique membership plan, you will be able to cover the cost of all essential eye care treatment, as well as your brand new eyewear. Some membership plans can be quite vague and a little confusing, so we have broken down our plan in to one simple monthly payment that will prevent you from breaking the bank. When you next visit us for your eye health check, simply ask a member of our friendly team if you can have the details of the membership. They will ask you to complete a form with your important details and will give you a full breakdown of the plan and following payments. Don't stress about the cost of your essential eye care, let our membership plan take care of it for you.